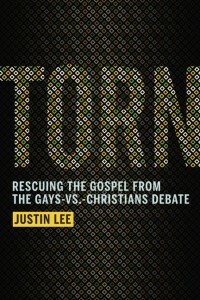 You need to read TORN: Rescuing the Gospel from the Gays-vs.-Christians Debate. (For my fellow nerds, that’s TORN, not TRON.) Gay or straight, for or against gay relationships, you need to read it. If you feel like this issue matters to the church, you need to read it. While TORN doesn’t release until November, as I write this it’s available for pre-order at almost half-off the retail price at Amazon.com. How do I know you need to read it? How do I know it’s the best book you’ll read this year? I’ve read the manuscript. Shhh. Don’t tell. It is hands down the best book I’ve read on homosexuality as it affects the Christian faith. You’d have to read thousands and thousands of pages in dozens of other books to get get what author Justin Lee has managed to condense into one 272-page book. TORN provides insightful, practical guidance for all committed Christians who wonder how to relate to gay friends or family members–or who struggle with their own sexuality. Convinced that “in a culture that sees gays and Christians as enemies, gay Christians are in a unique position to bring peace,” Lee demonstrates that people of faith on both sides of the debate can respect, learn from, and love one another. And while I’m copying and pasting, here’s the “About the Author” section from Amazon. Justin Lee is the founder and executive director of The Gay Christian Network (GCN), a nonprofit, interdenominational organization working to increase dialogue between gays and Christians and support people on both sides wrestling with related issues. A passionate Christian from a conservative evangelical background, Justin thought he knew everything there was to know about the Christian approach to homosexuality-until unexpected events turned his world upside down and forced him to reconsider everything he believed. Today, his organization works with individuals, families, and churches to stop the debate from tearing people apart. Justin’s work has garnered national attention and praise from gays and Christians from across the theological spectrum. He has been featured in numerous print, radio, and television venues including Dr. Phil, Anderson Cooper 360, the Associated Press, and a front page article in The New York Times. He is the director of the 2009 documentary Through My Eyes about the debate’s impact on young Christians, and the co-host of popular long-running podcast GCN Radio. Justin lives in Raleigh, NC. Hopefully, as we approach November, I’ll have an interview with Justin here on my blog. Did I mention you need to read TORN?